Just to confirm, playback is not occurring here, correct? Or is it occurring but there’s just no visual indication on the remote? Playback is occurring, but there’s no visual indication on the remote. Playback is faultless (no dropouts, no stuttering). Are there any patterns to this behavior that you’ve noticed? Does it seem to happen with specific types of content (TIDAL vs local, certain file types, etc.)? I only use local files, stored on a QNAP NAS. 99% of my collection are FLAC files. The albums which have been played while the problem occured were all FLAC files (16bit/44kHz). When did you first start noticing this behavior occur? 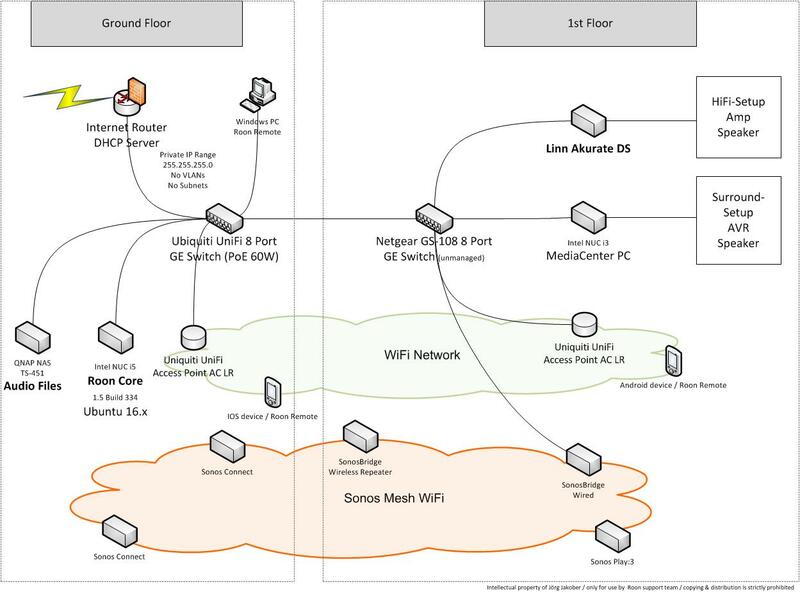 Were there any setup changes around that time, or were any apps that utilize the network (VoIP, AV, etc.) introduced? The problem occured last weekend for the first time. I had a listening session on friday. I played two albums in a row. When starting the third album the problem occurred. The second time the problem appeared was one day later. The problem occurred right at the beginning when starting the playback of the first album. My setup didn’t change around that time. The last software update was the last Roon build (but I had plenty of listening sessions without any problems since then). No recent firmware upgrades on the Linn unit, nor on the NAS or on any of the network equipment. here is a network diagram which (hopefully) contains all the required information. In case of any questions please get back to me. Thank you for the details here, @papa.jay! I think the next step is to enable some diagnostics on your account so our technical staff can get some more insight into what’s going on here. However, before I enable this feature, I’d like to ask for your help ensuring we gather the right information. First, can you please reproduce the issue once more and note the time at which the error occurs. Then respond here with that time, and I’ll make sure we review the diagnostics related to that timestamp. I would like to add that I too have experienced this with my Linn Sneaky, and this has happened since I first enabled Roon with the Linn device. I would suggest it has happened about 80% of the time I have used Roon to stream to the Linn device, and it happens randomly (i.e. sometimes after the 1st song, sometimes after the 2nd song, etc). Album: Who Will Be Next? Playback started. In Roon Remote app I can see the album cover but the visual indication (timer, waveform) about the progress of the track is not shown (as reported before). The next song started as well. The situation in Roon remote app remains unchanged. After the second song the playback stopped. I didn’t touch anything so far. The music is still not playing and Roon remote app is showing the same screen when I started song number 1. @dylan: have you had a chance to look into this issue ? any insights based on my diagnostic logs ? Apologies for the delay here! I wanted to reach out because I’ve been keeping an eye on our servers, waiting for the aforementioned diagnostics report. For some reason it is not reaching our servers, even after I tried re-enabling diagnostics on your account and gave it some time to try to upload once more. I also ran a quick test and I was able to submit a similar report from my setup here, so something else is going on. So we can move forward, I was hoping for now you could use the directions found here and send us over a set of logs using a shared Dropbox link. We will need logs from your Core machine. @dylan: any news on this ? Thanks for the update here. I checked in with the technical team, and they’re still currently investigating this and trying to reproduce this behavior in-house. It’s good to hear that this behavior has not occurred since your last post! I’ve sent your update along to the team to aid in the investigation and I’ll be sure to update you ASAP when the team provides their feedback. The first song was playing and I didn’t specifically look if the visual indication in the Roon Remote app was there or not. The second song was also playing but after song number 2 playback stopped. I looked at the Roon Remote app and saw that the timer besides the waveform was showing 0:00. I was able to start the next song by pressing the play button again but visual indication on the Roon Remote app was not happening. After one song playback stopped again. First song was playing without visual indication. Second song was play without visual indication. Then the music stopped. I zipped the latest logfiles and put them online again. Link was sent via PM. It would be great to get some feedback if you and your colleagues have been able to find the source of this problem. I just wanted to let you know that the problem didn’t reappear since my last post. In the meantime the system was upgraded to the latest Roon build and I got my Akurate DS/1 upgraded to DS/3 (which means, that the mainboard of the unit was replaced by a new one). Have your colleagues been able to find the source of this problem ? I’ll report back, in case the problem shows up again. Thanks for the update, we appreciate it! I’ve passed this along to the team. This is still something under investigation, so be sure to let us know if you see the issue return. after more than two months the issue reappeared a few minutes ago. The listening session started at “12/28 13:40:47”. I played an album followed by a few tracks from different albums added to the queue. At “12/28 14:55:25” I started a new song. The song played for 2/3rds. Suddenly the playback stopped. After this event I chose another album for playback. The music started, but there was no visual indication of the playback. I paused playback. After around 10 minutes I started playback again and visual indication was back to normal. I never experienced this this behaviour before. Up to now I either rebooted the Linn device or the Roon Core but it seeems that a certain amount of time also “fixes” the issue. I zipped the latest logs and send you the link for download via PM. In case you need anything let me know. Thanks for posting those timestamps and submitting those logs for analysis. I can confirm that we have received them and I have forwarded them to the QA team who is reviewing your case. I will be sure to let you know as soon as I hear back with their diagnosis but please be aware that it may take some time due to the holiday season as some staff is out of the office. Apologies for the delayed response here. I have had a meeting with the team today regarding your case and @seb_s’s case (Linn playback stops, remote not updated, timestamp in logfile not advancing) and we are looking into this issue further and possibly contacting Linn to try and resolve it. While I can’t comment on a specific timeline, I will be sure to let you and Seb know of any updates as they surface. thanks for getting back to me (us). Just for the records: the problem didn’t reappear sind my last report.